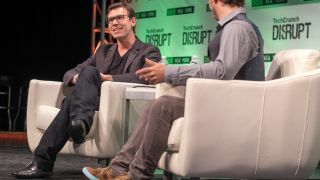 With Oculus VR announcing it will finally release a consumer version of its lauded Oculus Rift earlier this morning, it's no surprise pricing for the VR headset was the first question to come up at TechCrunch Disrupt in New York. And to answer the question Nate Mitchell, VP of Product at Oculus VR, predictably admitted the virtual-reality hardware company was not ready to announce anything. Mitchell, however, noted users should look at the Oculus Rift as a high-end, high-fidelity experience that will stand above the Gear VR, which Oculus VR has partnered with Samsung to produce. At the very least, this means users can expect the Oculus Rift will cost over $199 (about £126, AU$228). What's more, Mitchell said users will want a "nice gaming rig" just to drive the Oculus Rift as the headset is essentially acting as two HD monitors, rendering games and media twice for each of the user's individual eyes. "We're not talking about a high-end, crazy computer but something that can run modern games well today," he said. Moving forward the Oculus VR team is working on helping users understand what virtual reality is and what it's benefits are. On top of this, Mitchell said they are working on cracking the code for VR input from an effective controller to what VR space could be in 10 years. "This is at the heart of how you'll be using the Rift" Mitchell said "When the Rift ships a lot of the experiences are going to be game pad focused and potentially we could have a bunch of other devices to make things more interesting." If there's one point Mitchel wanted to drive home, it was Oculus VR's plans to build out the Rift as the best VR experience of all. In the future that will entail a curated experience where the VR company will oversee any and all experiences that come to the Rift. What's more, it seems Mitchell also wants to control what happens on the peripheral front. "Third party peripherals are necessarily the best way to do that" Mitchell said. "Sure you can go out and do that but the audience you're going to be able to address is going to be much smaller, and right now there's a focus on delivering the best experience to market." It's easy to see how Oculus VR wants to make sure every VR experience with the Oculus Rift is perfect because as soon as complaints arise, it could lead to the death of this nascent technology. But, Oculus VR seems to be moving away from the open-source roots that helped the company make VR technology a reality in the first place.